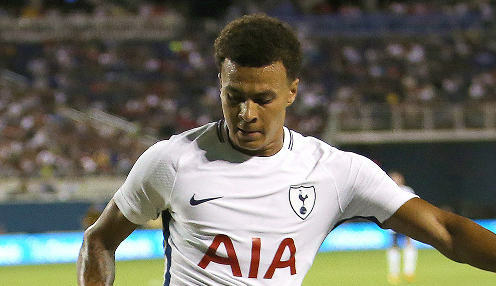 Tottenham Hotspur midfielder Dele Alli has been ruled out of England's friendly international against Switzerland on Tuesday due to a slight muscle strain. The 22-year-old played the full 90 minutes of the 2-1 Nations League defeat to Spain at Wembley on Saturday evening, but has been allowed to return to his club for treatment after complaining of pain in his leg. A tweet from The FA confirmed: "Dele Alli has withdrawn from the squad due to a minor muscle strain picked up on Saturday. "He'll return to Spurs for further treatment, with no further additions to the Three Lions squad planned." The Three Lions have already added Leicester City duo Ben Chilwell and Demarai Gray to their squad for the clash with the Swiss, which takes place at the home of the Foxes, the King Power Stadium, on Tuesday evening. England and Switzerland met in the qualifying campaign for the 2016 European Championships, with the Three Lions claiming 2-0 victories both home and away. Current skipper Harry Kane and Wayne Rooney were the goalscorers for the hosts in their Wembley success, while Danny Welbeck netted both goals in the victory in Basel. England are 7/1 to secure another 2-0 win on Tuesday evening, with Kane priced at 20/21 to score at any time, with the hosts 6/5 to keep a clean sheet in Leicester. Gareth Southgate is expected to make a host of changes to the side who lost to Spain, having told reporters: "We have to give the other players that haven't played a start, it's important for their development. "Some of the guys were suffering towards the end (against Spain), so there are players that have a valid case for getting into the starting team that we need to see."